What is the big question you need to answer before hiring a Managed Services Provider? So what happens if your IT work is outsourced to an MSP? There are many good things but strategy can be the very best. First ask yourself: will the MSP work closely with you to receive and understand the strategic plans of the company; can they articulate and execute a plan to deliver services that support that strategy; are they an established company with experience in IT-Ops? Most MSP’s are great technical hands, but haven’t had to implement an IT operational plan that supported the business strategy. ProxyIT helps IT groups, by providing structural and procedural frameworks that align their services with the company’s goals. If you don’t run your own IT department, or don’t have a CIO, consider a contract-CIO, to manage strategy and direct the MSP(s) on execution. If you don’t know where to start: ProxyIT will tell you if your strategy needs are beyond our scope, and will help you get the right support. We frequently partner with “The Office of the CIO” (Dean Lane is the Founder at www.oocio.com .) Working together, ProxyIT and Office of the CIO, provide our clients strategic, and tactical, IT support plans. Together we’ve helped companies get more value from IT-Ops, sometimes help them to down size IT- Ops, or have helped them to re-set and restart whole organizations. We’ve also defined, setup, recruited teams, and handed over fully established IT departments created and specifically tuned for the company’s needs. Ten years of collaboration on strategic support for businesses has given us keen insights into transforming IT-Ops into a “value-center”. Call me to have a conversation on how we can improve your business from the IT strategy. Stay with in-house IT or outsource to an external provider? Read on to see why you should consider an external provider. Our client had a single senior engineer handling DevOps and Production Ops. There was a maintenance backlog. Production outages kept the engineer busy so development was throttled. The company was contemplating adding another engineer when ProxyIT was introduced. Our challenge was to stabilize IT Operations. Even at a projected staffing cost of more than $300K, cost was the second priority. 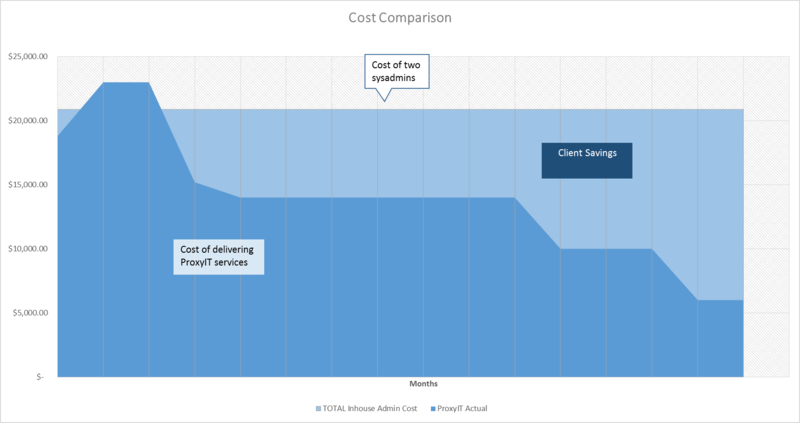 How were we able to achieve these cost savings for our client? The illustration below tells our story and shows the cost savings that accrued. Initially ProxyIT dedicated significant resources to the engagement to bring projects and tasks under control. We used the combined attention of several of our staff; costs increased. But decreasing the maintenance backlog was critical to restoring production availability, and while our initial cost was higher than forecast, the production availability improved almost immediately. At the 4 month mark the ProxyIT costs approximated the cost of a single senior engineer’s salary. Working to standard operating procedures and performing regular maintenance reduced man hours lost to outages and recovery. At 16 months our cost dropped to less than half the salary of a senior engineer. The ability to apply man hours only when required (in an increasingly stable environment) allowed us to provide the same service at a much lower cost and quicker responses time than a dedicated internal team could manage. Can we do this for you? Call and we can discuss it! A personal mechanic for your Jaguar? If you own an early classic-Jaguar you have a special machine that has specific and specialized maintenance needs. But did you hire your own mechanic? I.T. infrastructures too are complex and require special skills … and you’ve hired your own mechanic; or worse: several. There is a point at which it makes sense to invest in a committed IT staff. In a large percentage of businesses though, the investment and commitment of running IT comes at a cost greater than the value returned. And: it takes your focus away from your core business. If you spend even 2 hours hour per week managing to the operation of the IT infrastructure, you’ve lost a day each month. Would a full day each month, spent on improving your core business, help? There are several alternatives to running an internal IT Department; Individual Contractors, Offshore Outsource, Managed Services teams. But which? There is no single best answer. But there is help. ProxyIT is a “Defined-Delivery, Managed Service Provider”. We sort through the actual technical needs of the business and define a service-delivery agreement that the meets your exact requirements. We can help with the decision, and if engaged we will return more value than just the staff support; our staff will guide daily ops, and deliver projects on time. You set the business goal, the direction, and your priorities – we’ll give you an IT Operations solution that gives back that day per month. Alright! You’ve looked at the flailing of your 130% Systems Administrator, and decided to hire backup. (See the ProxyIT Blog: the 130% Systems Administrator) But does it address the actual problem? If the problem was just too much work, then your problem is solved – almost. But companies we interview have too many complex tasks rather than simply too much work. They need a System Admin, a DBA, a Network Engineer, a Security Specialist, a Windows specialist, and a Dev-Ops Engineer; just not all at once, and not 100% of the time. Some have hired two employees to solve the skills problem, and now have an inefficient work force; the 65% Systems Administrator(s). They’ve hired a contractor to fix a specific problem and gained no institutional knowledge – or documentation – on the departure. And … without a career development path, attrition is still a problem. Since most businesses never develop the organizational mass to justify a fully realized IT department, ( staffing levels, skills, leadership), the best IT structure is a hybrid: a staff person and a Managed Services Provider. The MSP can provide specific skill sets, as well as simple manpower. By providing IT Management oversight, they help create or maintain the knowledge-and-practice continuity that is often lost with independent contractors. More important though: A good MSP will participate in IT-Ops strategy, applying experience and best practices that support the company’s business objectives; a skill otherwise not likely to evolve in the company. ProxyIT has been in business since 2002. We have led IT departments, helped out IT Ops teams, replaced contractors, replaced and rebuilt IT Teams. With the result: many of our clients have been with us for more than 5 years. Call us. We’ll show you how we can help your business. Often a business will have a talented individual managing all of the company IT-technical needs, large and small. The business sees it as having IT Ops “all managed.” In real life we see this as the 130% Systems Administrator. Has too many things to do – and is too busy to do them all. And worse, as is often the case, the willing victim tries to serve every department’s every request, and fails everybody. We’ve actually had companies call us in to “do something about this under performer”. Is half-good at a dozen things – where the Administrator has good core skills, but as the company infrastructure has grown, becomes ineffective as Systems Administrator, Network Engineer, and a Data Base Admin, and Web Developer, all at once. Can’t achieve career improvement – The challenge is how do you keep them abreast of technology. It is problem especially common in a businesses that are not technology based. I’m certain that some of the 130%’ers have been given the latitude of learning new technologies on the job. But the attrition of IT Engineers is high, and not surprisingly, MUCH higher from small IT shops. Even large companies with professionally managed, well-staffed, and adequately funded IT Departments suffer systems outages, security breaches, and loss of data. What is the 130% engineer going to do to keep up? Two Engineers isn’t the best answer either. (See the ProxyIT Blog that follows: The 65% Systems Administrator). Taking care of your Systems Administrator isn’t altruistic. It will affect the health of the business. Staff Augmentation: We’ll free up your Engineer to focus on critical tasks. Provide Engineers for narrowly defined tasks and duties – yes: you CAN hire half of an Engineer! Provide vacation and sick day coverage for your Engineer, or IT Staff. We will bring our IT Management to help your company – yes: you CAN hire half of a CIO! If you have a 130% System Administrator call us. We’ll help you and your System Administrator. The IRS has set the standard for compliance to email retention rules. Here is a interesting tool, widely available that will give you the same outcome. Just place the target disk drive on a solid surface and apply this tool with vigor. There is no upper limit to the number of times you apply this tool, only too little. So contemplate your most frustrating concerns about IT Governance … and have at it! While I’m not prepared to recommend it to MY clients, it seems a reasonable risk given that the Congress seems incapable of policing their own laws. Just remember the key phrase: “there was nothing important on the device – so we destroyed it”. Brilliant! Is an embedded IT Organization the best use of resources? AN IT TEAM OF MY OWN. I get it. The natural tendency is for business leaders to want to have their IT support “up close and personal”. I’ve been there, and had the same reaction. The reality though, is that unless you ALSO have qualified IT Management, you’ll be the one dealing with a technical team that is driven by goals and objectives set by the other business units of your company … and not always pulling together in the same direction. That IT team, or person, will be subject to on-the-fly requests, variable priorities, and will in all likelihood not have the skills to manage everyone’s expectations. So: You manage your OWN responsibilities AND with setting and negotiating priorities, managing technology migration, dealing with time and resource issues … well … you’ll be the daily arbiter of IT Operations activity.. If you are the CFO, you’ll find that it is a world apart from both your experience and WILL distract from your daily duties. If you are the VP of Engineering, you will be dealing with the niggling details of the Sales department’s slide presentation software, rather than managing the development of new product. Every company can have an IT Team, WITH Management oversight. ProxyIT operates as an extension of your business. An understanding of the COMPANY goals allows us to deal with management of issues and priorities. A deep understanding of the tools and practices of IT Operations lets us move the right resource to the task at hand, and to deal with the fallout of conflicting priorities. We will give you the information to help youset the technical direction and forecast the cost of technology for the future. I’ll bring the team to you. We will deliver IT Ops to your business.